The Upstate Bariatric Surgery team is here to help you with your weight loss journey. Our Metabolic and Bariatric Surgery Program is the longest-established in Central New York and has a proven track record of providing great care to patients. Upstate is accredited by MBSAQIP. Our comprehensive practice is located at Upstate University Hospital’s Community Campus and is led by Flavia Soto, MD, who is fellowship-trained in bariatric surgery. The team members below work together to provide every patient with compassionate, personalized treatment. 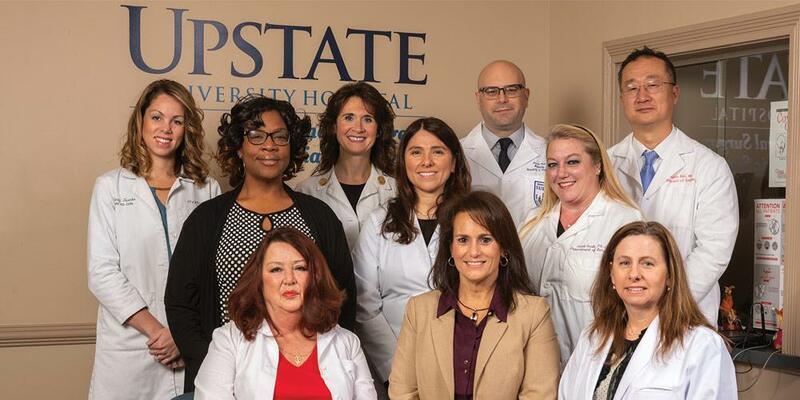 Most of our Bariatric surgeries are scheduled for Upstate Hospital on the Community Campus. All of your clinic appointments as well as the information sessions are also held on the community campus. Our clinic is located in Suite 2B in the Physicians Office Bldg. (POB) north which is adjacent and connected to the parking garage on the Community Campus. Last Modified: February 06, 2019. Contact Cazella Hammerle with questions about the content of this page.